Phosphorus is an essential element for all life forms. While phosphorus is vital for growth in plants and animals, it can be problematic for aquaria inhabitants, particularly coral. In water, phosphorus exists almost solely in the form of phosphate, or PO43-. There are several forms of phosphate, but the two forms most important for aquaria are organophosphate and orthophosphate. Organophosphate refers to phosphate that is organically bound to plant or animal tissue. This type of phosphate is formed primarily by biological processes, which are continually occurring in aquaria systems. Orthophosphate refers to phosphate that is inorganic, or reactive. This type of phosphate is soluble and readily available for absorption; it is the only form of phosphate that can be directly determined. The main source of phosphorus in reef aquaria is through food that is introduced on a daily basis. Phosphorus is a necessary part of any substantial fish food, so in order to prevent overfeeding and therefore, an over abundance of nutrients, much care is taken by aquarists. There is also continuous, production of phosphorus within the tank itself, through decaying plant material, the breakdown of uneaten fish food, and excretion from fish and other organisms. Tap water or reverse osmosis water is used to replace evaporated water and control the salt concentration in tanks, but this replacement water can also be a source of phosphorus in aquaria. Both forms of water contain low to trace amounts of phosphorus and will have negative effects if the accumulating levels are not controlled. The ideal range of phosphorus in saltwater reef aquaria is extremely low, at 0 to 30 parts per billion (ppb). If phosphorus is present in concentrations greater than 30 ppb, the precipitation of calcium carbonate may be inhibited for certain species of coral. This has a direct impact on the coral, as calcification allows for their growth, survival, and larval development. Another consequence of high phosphorus concentrations is the overabundance of algae. Phosphorus is a limiting nutrient in saltwater systems and an excess can result in eutrophication, which promotes excess growth of algae and saltwater plants. As plants and algae grow and consequently die and decay, this decomposition consumes available oxygen and can lead to hypoxic (low oxygen) conditions. Without a sufficient amount of dissolved oxygen available in the tank, the living organisms cannot thrive. The concentration of phosphorus in saltwater reef aquaria is one of the most important concerns for reef-keeping hobbyists. A saltwater reef aquarium supplier contacted Hanna Instruments with an interest in measuring the phosphorus levels in their tanks. With a large number of tanks to maintain each day, the supplier wanted a portable, convenient instrument to ensure the phosphorus levels were within their acceptable range of 0 to 30 ppb. 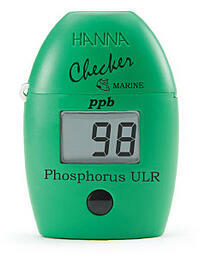 The Marine Phosphorus Ultra Low Range Checker® HC – HI736 was recommended due to its ease of use and accurate results. The HI736 has a range of 0 to 200 ppb, which encompassed their phosphorus range. The Checker also features a resolution of 1 ppb and an accuracy of ±5 ppb, which was a large improvement in resolution and accuracy from the chemical test strips they were previously using and gave the customer confidence in monitoring their aquaria tanks. The supplier was able to use the Ultra-Low Range Phosphorus Checker to measure each tank in succession, and they appreciated the ability to do on-the-spot analysis with a single button. After zeroing the HI736 with the tank water itself, the supplier simply added one packet of reagent to their sample and shook for 2 minutes. The mixed sample was then put into the Checker, where the supplier pressed and held down the button to start the automatic timer. The timer ensures that the phosphorus and chemical reagent react completely before measuring the sample. After three minutes, the Checker automatically took the measurement and displayed the concentration of phosphorus in ppb. Another employee at the company wanted to know the results in the form of phosphate (PO43-), in ppm, instead of phosphorus (P), in ppb. Hanna informed them that phosphate and phosphorus are simply different units of the same measurement, depending on the molecular weight utilized in the calculation. To convert from ppb phosphorus to ppb phosphate, simply multiply by 3.066. To convert from ppb phosphate to parts per million (ppm) phosphate, the reading is then divided by 1000. Upon getting the phosphorus reading, the supplier was able to identify tanks that had high or increased phosphorus levels that would be problematic to the fish and coral. With a speedy diagnosis, they could adjust the phosphorus levels before any serious problems could occur. The HI736 Ultra-Low Range Phosphorus Checker®HC was verified as an economical and valuable tool for this coral reef supplier.